Of all the water-sports, windsurfing is the one that brings the most people to Maui. Whether you are looking to get into windsurfing for the first time, or are an expert, there are any numbers of beaches suitable for windsurfing. Most well known is world renowned Ho’okipa Beach, an easy 5 minute drive from Maui by the Sea Cottage. 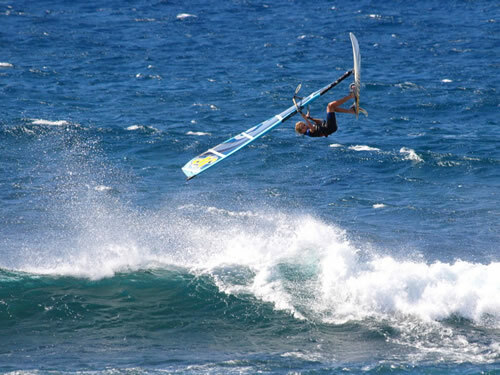 For the more relaxed windsurfer, or those who prefer slalom sailing over wave sailing,there is Kanaha Beach Park, a short 10 minute drive from Maui by the Sea. Kanaha’s flat water is the perfect place to learn windsurfing or to improve one’s skills. Several well-known and highly experienced windsurfing schools conduct their lessons at Kanaha. See “LINKS” section for recommended schools and contact information. In between these two beaches is Sprecklesville Beach, a short 5 minute drive from Maui by the Sea Cottage. While a bit harder to find and lacking the amenities and abundant parking of either Ho’okipa or Kanaha, its small size offers a cozy feel from where you can enjoy both wave or slalom sailing. If one looks hard enough they can find rideable waves somewhere on Maui all year round. The biggest waves occur during the winter months between October-April on Maui’s north shore, right in front of, and all around Maui by the Sea Cottage. On the days when “Jaws” is pumping the spectator can access this spectacular, gigantic, adrenaline making site, by driving to the edge of the over-looking cliff from where they can admire the men (and a few women) who wait all year for that “once in a lifetime” wave. Next on the list is the much more accessible Ho’okipa break. The very talented surfer will go to Ho’okipa, which in winter, is often a wonderful wide- screen display of bottom turns, off the lips, 360’s, and “airs”. A fun place to surf or to sit and watch. In summer, the surf will hit the south shore on the other side of the island, between a 30 minute to 1 hour drive from Maui by the Sea Cottage. For those looking to give surfing a try, that’s where the schools are operating. In our “LINKS” page you can find our recommended surf schools along with their contact information. The south shore is also where the long boarders love to surf. Located all along the coast before Lahaina, these beaches with their easier waves, longer rides and super easy access, make them perfect for a day of surfing and sunbathing. A couple of the more well-known locations are Launiupoko and Thousand Peaks. 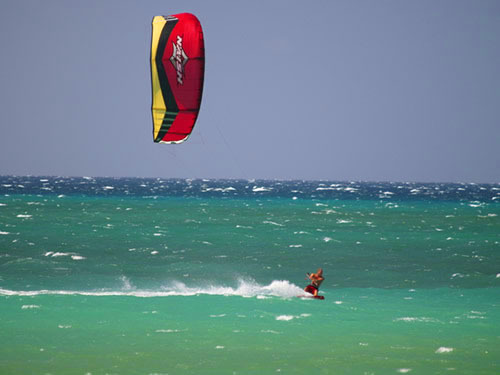 Kite surfing, the cousin of windsurfing, has been, for both safety and security reasons, located at lower Kanaha Beach. A perfect little bay, easy parking, lots of schools. Lanes, below Ho’okipa is the other permitted spot, yet the launch over the 1st reef makes it a little more technical. Experts only. For the spectator, kite boarding is spectacular. The combination of the kite and the lighter boards, make long, high, twisting jumps possible and fun to watch and photograph. Paddle boarding is the latest water sports trend and rapidly growing in popularity. In paddle boarding you will experience a different type of ocean experience, the most peaceful ride on the ocean.On a paddle board one is regularly joined by sea turtles and even dolphins! While one can paddle board off almost any beach on Maui, some of the best are within a short distance from Maui by the Sea Cottage. While, generally, paddle boarding is done in calmer water, as you start feeling more in control, go ahead, surf the outside reefs, and do what is known on Maui, as a “coast run” (a nonstop adventure where one starts at Ho’okipa and boards to Kanaha). For a coast run do not be afraid of a little wind, even though the ocean gets a little rougher, the trades will push you down the coast and make the ride easier. 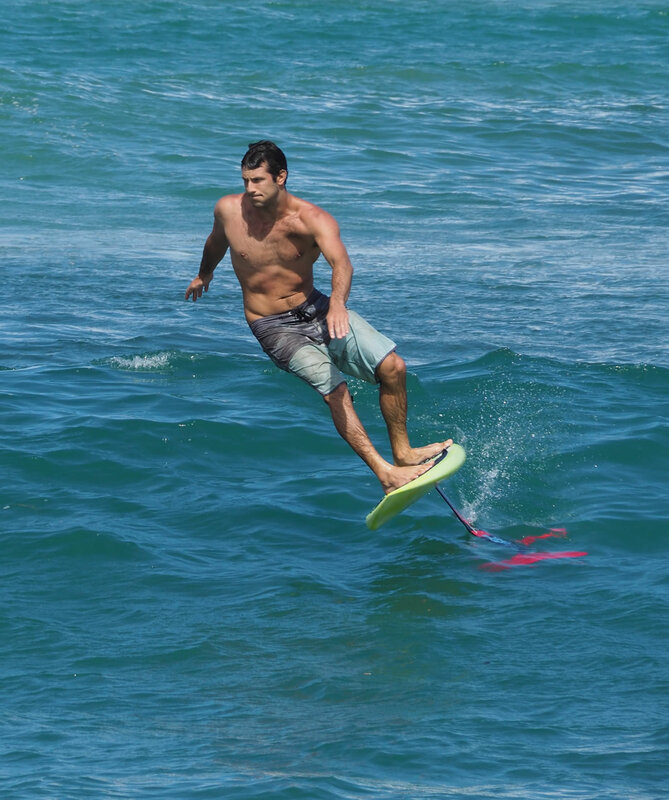 And of course the extreme paddle boarder will dare “charging” the Ho’okipa surf. Boogie boarding is a cousin of surfing. Experienced boogie boarders can execute a dizzying array of flips, 360’s and carving turns while laying on this little board. For the “newbie” boogie boarding offers a relatively simple entry into the world of water-sports. If one has never boogie boarded before, BEWARE! While it looks simple enough, this inoffensive little sponge board, can throw you for a loop. Many tourists will go innocently and happily running into the shore break to find themselves 2 minutes later, stripped of board and bathing suits, head planted in the sand wondering what just happened!!!! The shore break can be brutal and unexpected. Never turn your back to the surf while you are in the water. Watch the locals before you dare adventuring yourself in. For shore break boogie boarding here are two of the nicest spots, Baldwin Beach (North Shore) and beautiful Big Beach (South Shore). For wave riding, any other surf spot is possible.Boogie boards can be inexpensively purchased in many stores around the island. Simple, easy. Get a mask, a snorkel, a pair of fins and jump in. This equipment can be rented or purchased. Off the South side beaches, especially first thing in the morning, one can see dozens of incredibly colorful tropical fish swimming within arm’s reach of the surface and yes, it is possible to swim next to a turtle, and yes, it is possible to see a ray or an octopus. All south-side beaches are easy 30 minute drives from Maui by the Sea Cottage and most offer ample parking, restrooms and showers. I like to go to the Prince Beach early in the morning. Ulua Beach in Wailea and Kamaloe Beach Park are also popular areas. The most popular snorkeling is at the famous Molokini Crater. Accessible through any number of reputable boat tour companies, this trip is a highlight for many visitors to Maui. Most morning cruises leave around 7 30-8 am from Ma’alea Harbor, about 20 minutes from Maui by the Sea Cottage. 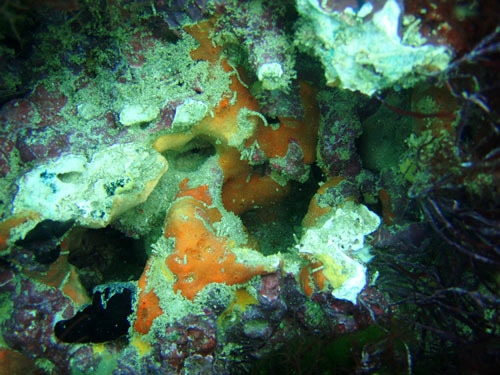 For the scuba diver, Maui is a paradise of opportunities. In a few short days one can get their certification through several highly experienced schools and have access to incredible under water vistas. Many can be found on well-known shore dives around Maui, while there are a few that require going out with a Dive Boat operator. One of the most spectacular is “Cathedrals” just off the coast of Lanai Island and, of course, Molokini Crater.